The tyrant flycatchers are a large family of passerine birds which occur throughout North and South America, but are mainly tropical in distribution. They are members of suborder Tyranni (suboscines) and so do not have the sophisticated vocal capabilities of the songbirds. The becards and tityras were formerly considered to be cotingas, but are now usually included in the Tyrannidae. They are also sometimes given their own family, the Tityridae. Most, but not all, are rather plain, and many have erectile crests. They superficially resemble the Old World flycatchers, but are more robust with stronger bills. As the name implies, most are insectivorous, but some will eat fruit. Species richness of Tyrannidae, when compared to habitat, is highly variable. The habitats of tropical lowland evergreen forest and montane evergreen forest have the highest single site species diversity while many habitats including rivers, palm forest, possible white sand forest, tropical deciduous forest edge, southern temperate forest, southern temperate forest edge, semihumid/humid montane scrub, and northern temperate grassland have the lowest single species diversity. The variation between the highest and the lowest is extreme; ninety species can be found in the tropical lowland evergreen forests while only one species can be found at the habitats listed above. This may be due in part to the fewer niches found in certain areas and therefore fewer places for the species to occupy. Tyrannidae specialization among habitat is very strong in tropical lowland evergreen forests and montane evergreen forests. These habitat types therefore display the greatest specialization. The counts differ by three species (tropical lowland evergreen forests have 49 endemic species and montane evergreen forests have 46 endemic species). It can be assumed that they both have similar levels of specialization. Regionally, the South Atlantic Coast has a significanltly higher species richness with the Manabí-Tumbes region following closely behind. 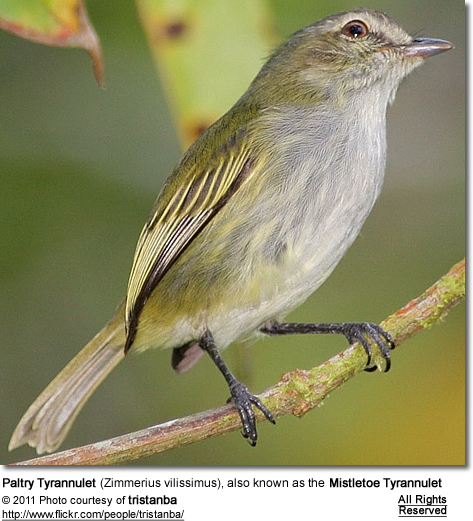 The Northern Beardless Tyrannulet (Camptostoma imberbe) and the Rose-throated Becard (Pachyramphus aglaiae) are protected in the US under the Migratory Bird Treaty Act of 1918.